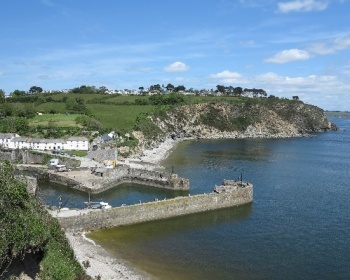 Charlestown is an interesting and historic working port with pebble & sand beaches either side of the harbour. There are steps down to the east Charlestown beach and a short slope to the west beach. Dogs are banned on Charlestown Beach all year. Charlestown is about 1 mile from St Austell. Approach St Austell on the A390 from east or west. On the A390 turn off at the Mount Charles roundabout to Charlestown (signposted to Charlestown) and follow this road down to Charlestown. Just before Charlestown harbour there is a small roundabout. Turn right for the car park. 1 small car park and also some road parking at Charlestown. Pub, Shipwreck & Heritage Museum in Charlestown.